DEXTER “The Blade” JACKSON took his second victory in a row victory at the Australian Grand Prix. 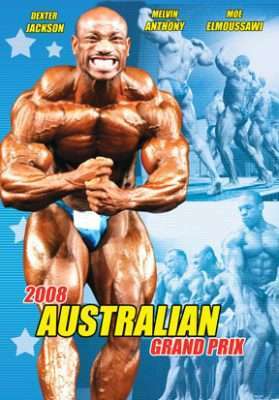 This 2 DVD set presents the complete event from the Pro pump room through the Pro Contest prejudging and Finals plus the amateur contest and King of the Bench contest to pro stars training in the gym next day. This video presents the complete event from the Pro pump room through the Pro Contest prejudging and Finals plus the amateur contest and King of the Bench contest to pro stars training in the gym next day. On March 8th the 2008 Australian Grand Prix saw DEXTER “The Blade” JACKSON take his second victory in a row, and 3rd victory at this event. 15 top pros took to the stage at the Dallas Brooks Centre, Melbourne’s long time spiritual home of bodybuilding. The video also includes the complete 2008 NPFC All Sates Bodybuilding Championships for men and women with the Men’s Open Winner being LOCKIE MAXWELL-WRIGHT. DANIELA O’MARA won the Fitness Class and JAN JOHNSON won the Figure Class and PAUL JAYILIAN won the Novice Class. The complete amateur contest, men and women; King of the Bench pro benchpress contest, the Prejudging & Finals, posedown and awards. DEXTER JACKSON’S CONTEST HISTORY AS AT MARCH 2013.